So I’m about to begin gigging again after about a 25 year absence. When I did before long ago I had a 4 piece; two crash cymbals; splash; hi-hat and a ride. My set up now is a bit larger. 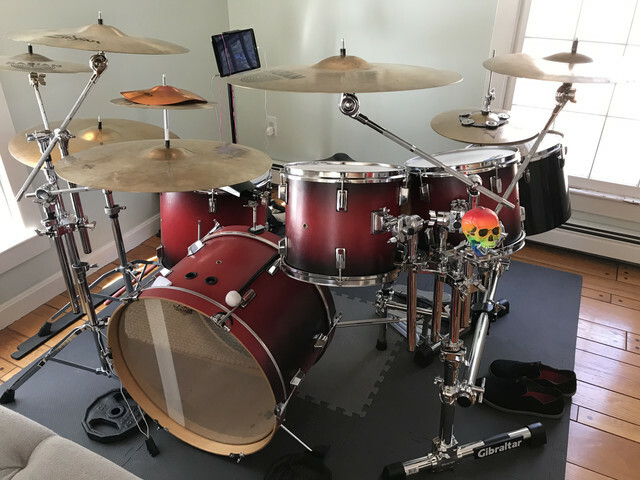 6 drums, three cymbal stands (one is a “tree” with 3 booms arms coming off), one small rack with tom mounts, one concert tom and legless hihat stand attached, 7 cymbals in all, double bass pedal and throne. In your experience is this just a ridiculous amount of stuff to expect to bring to a regular bar? I've played larger places and brought a 7-piece racked Beauford-type set up. I've played tiny bars and done the 4-piece everything-on-a-stand thing. I will say that the older I get, the less enamored I am with lugging a lot of stuff. Thanks both. I’m 45 now so not looking to overdo it. Guess I’ll find out soon enough. Have either of you ever had issues with soundperson complaints about how loud your cymbals are? I have mostly Sabian xplosion and A customs. I concur with the gentlemen above. If you have the space to set it up, don't mind lugging it, and if everything has a use to you, as far as the music and expressing yourself..go for it. I honestly would LOVE to bring more gear but, lugging it around is a drag, especially at 2am, or in the Winter. I think I'll just leave the 'big' kit at home to practice, and the 'little' kit for gigging. I've never had a complaint. My pies are AA's and an HH RBDB ride. I hit for the room. If it's a big one, I'll lay into them a bit more. I gig with a four by four, which is the standard four piece with two crash, ride and hats. Lately l have been practicing and jamming on a six piece, with two extra crash cymbals. My inner Portnoy wants me to add a double pedal, splash, maybe a china cymbal, and a few percussion items as well. My plan is to see how and what the extras bring to the music before l try to figure out how to stuff them in the bag, and encroach on the bass players foot print. Like others here have replied, space, musical need, and enthusiasm will determine what you bring and what you leave behind. You have to figure out the rock, paper ,scissors aspect of that for yourself. Also, welcome back and good luck with your gigging. Age and absence will no doubt bring an extra tickle of joy to the experience. As my fellow PDF contributors above say.. Only use what you want to carry and lug around... And depending on how big your stage area that is for you only can fit.. You don't wanna be a stage hog with a giant kit. But no bigger than a five piece kit with a few crashes,ride and hihats is all you really need for like smaller gigs in bars.. Specially if you aren't playing gigantic stadium size venues. And not hold up the band(s) setting up. This is why I’m ALWAYS the first one there. I stake my claim on my plot of land then let them fight over the rest. This is great stuff for me - thank you ALL. Yes, I bought the small stealth rack to be able to assemble the complete left side of my kit off stage and have another guy help me bring that up and put in place. May get another for the other side. Duly noted about being the first one there. !